A "sequel" to Acoustic I, which was produced in 2001. 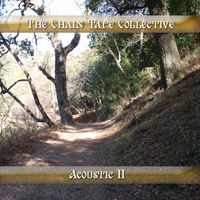 All the tracks are "acoustic," or at least dealing with acoustic instruments and/or dynamics. conception during annunciation, so a kind of synchronicity, or whatever you call it. Voice - rinus van alebeek, voice - mireia guzman; other sounds, if there are any - magnus schaefer; hum due to sound recording quality of the cassette player whose name i forgot. A multitracked soprano saxophone collage recorded over a 7 day period. Different effects were achieved by circular breathing and blowing through the horn in different ways, with and without a mouthpiece and reed effects were also achieved by moving the horn around, varying the distance from the microphones in real time. The final mix was sweetened with a touch of reverb. No other digital/electronic effects were used. Recording was done in 96k stereo in Rezound using a Linux laptop with an Echo Indigo sound card. Mics were a pair of cheap omni-directional condensors from Musician's Friend. Horn was a Selmer Super Action 80 Series II with Vandoren mounthpiece, ligature, and reeds. There's a wonderful little store/nursery in Cambria called "Heart's Ease," which has in the garden a gazebo filled with a variety of chimes and bells. I stood in the center of it and recorded the sound of the bells as the winds caused their metals to collide in some beautiful tonalities and resonances. I did this on two separate occasions and blended them together. I added a finger picked acoustic guitar accompaniment which is decidedly influenced by Eva Cassidy's version of "Cathy's Song," which I'd been listening to at the time. I really enjoy listening to this - the chiming bells add such atmosphere. Ozark resonator guitar, up-turned wok lid, cymbals, edits, production, ACiDification etc. Guitar parts recorded to minidisc, transferred to computer, then chopped and changed into something approximating an orchestra of resonation. Final section constructed from a single string scrape which caught my attention. The basic tracks for 'our understanding' are three field recordings made with my Microtrack 24/96 - backyard ambience, roadworks, and the creaking of some bamboo flagpoles in the wind. The recordings were processed in Ableton Live 7 with a wide variety of effects, which I tend to use as my instruments - the simplest way of producing hitherto unheard sounds. Recorded during November, December 2007 & January 2008, postproduction, postcomposing and mixing during February 2008. Only acoustic sounds found in or outside my house are used. Only a minimum of processing has been done. Postproduction was mostly mixing layers of acoustic sounds together. Piano layers played, looped and mixed on the fly. Recorded live in January 2008. Acoustic guitar, loopers, eBow, lap slide recorded live in some anonymous hotel room. I was there man. I was in that hotel. I was in room 224, next door to yours. When I woke up that night, I heard you working away. I thought someone was editing the soundtrack to an Estonian travelogue... little did I know it was a creative genius. Waiting In The Rain was created from a riff I wrote while waiting for an old lover that called but never showed. The song is about anticipation, patience, wonder, reflection, and the moments before truth is revealed. It was recorded in one take and had no edits. The loops were done in real time with a Gibson Echoplex. I used a Breedlove Atlas Pro into an Echoplex, MOTU 8 pre and my Macbook running Ableton Live.